"Can a poor nation like Bhutan achieve limited modernization, adopting only the media, the particular technologies, and the developmental policies that fit into its odd concept of GNH? Will Bhutan keep its forests off-limits to loggers? Will it continue to put a cap on the number of tourists who visit the country? Can it afford to invest more than a third of its budget in health and education? So long as Bhutan declines foreign investment that goes against its environmental policies or infringes upon its sovereignty, it can do all of these things. Whether it should is something the Bhutanese themselves must decide." EA standard had more answers to the questions i posed yesterday when reading about the riots. I was about to pick out excerpts but the whole piece seems quite important, so i will put it here. It is clear the country is headed for a referendum after Thursday night’s vote in Parliament. It will be the first time for the country to conducting a referendum. A referendum gives citizens the final say on whether what is being given to them is acceptable. Unlike in the national elections in which voters pick a particular candidate, a referendum is basically a Yes or No vote. Voters have to adopt or reject the Draft Constitution in its entirety. After the Attorney-General publishes the proposed new constitution, the Constitution of Kenya Review Commission (CKRC) embarks on two months of civic education ahead of the referendum scheduled for November. To participate, one has to be a registered voter and be in possession of a national identity card. Within 30 days of the submission of the Bomas Draft, the A-G will publish the proposed constitution that will incorporate proposals made from the consensus building process. Kenyans will be able to engage in public debate on its contents. Within 90 days of the publication of Constitutional Bill, the Electoral Commission of Kenya will hold a national referendum on the proposed constitution. ECK will also conduct civic education. If the majority of Kenyans vote for the constitution, it will be adopted, otherwise it will be considered rejected. Within 14 days of the referendum, the President will promulgate and publish the new constitution, if it is accepted, and it then comes into force. While Kanu and LDP have all along demanded that the Bomas Draft be subjected to a referendum without any alteration, the Government has proposed changes first. While the ECK puts the cost of referendum at a conservative figure of Sh2 billion, independent estimates say it could double. Added to the Sh4 billion taken by the review, a new constitution could cost Kenyans in excess of Sh6 billion, the most expensive official project. Kabete MP, Paul Muite a key proponent of the referendum, says subjecting the constitution to a popular vote is the only way to satisfy the public. To see who voted for or against the review, the standard also does a good job. Link. I am saving the information from this link as it is important to remember who did what for the 2007 elections. Noted that Prof. Anyang Nyongo was among those that voted against the review. So hmm. "One man was killed and five more were injured - two of them policemen - in violence linked to attempts at blocking debate on the new Constitution yesterday." In Mombasa, some youths demonstrated while carrying banners which read: "We want the Bomas Draft Constitution only." 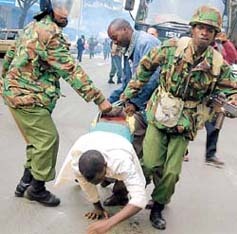 "Never have I ever been so ashamed to be a Kenyan. 90 people are massacred as MPs are stuffing their greedy bellies with chicken and samosas in coast as they completely change the constitution draft to suit themselves. The President could not even be bothered to go and console the families of the victims. And now we are being tear gassed for expressing our views?" I feel like i need more information about what the MP's(kenyan members of parliament) are trying to do with the constitution. I am still confused as to what is happening, before we can even start talking about freedom of expression (clearly being violated by the govt). The Kenyan journalist John Kamau has a post about the riots, his blog will definitely help in figuring out what is going on. (Thank you). his post on the trouble in NE was especially informative and as was his article that appeared in the standard. Mental acrobatics also blogged about the neglect that NE has endured and the important connection between environment and peace. La vox Humaine blogged about the NE massacre, saying "bowling for columbine comes to kenya"
This was rebroadcast today. Runs the gamut from lawyer jokes, knock knock, how many ___ does it take to screw a light bulb, GW and Kerry...etc. On Cheney's health issues, GW was heard saying "Men dont have anginas". Kerry walks and into a bar, and the bartender asks "Why the long face?" Q:Why did the popsicle cross the road? A: Coz it was stuck to the chicken. He is between a *rock and a turd blossom. for the newsweek story click here. sidenote: I was wondering what was off about the New Daily show set, surfergirl of slate, just captures it. What's with Cartoon network moving Family guy from 10:30 to 10pm, why make us choose between stewie and jon stewart? No fair! 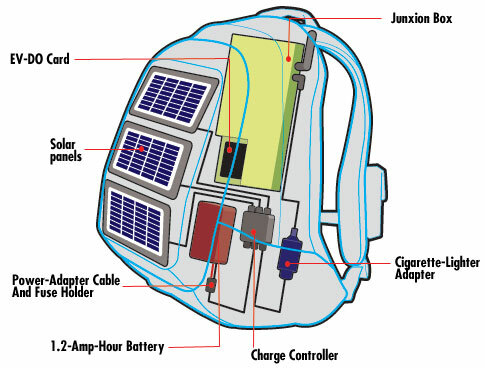 this just makes your solar backpack a whole lot cooler. 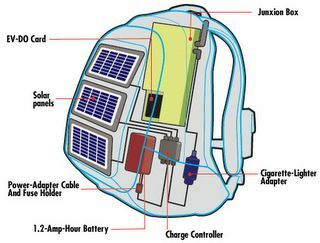 The backpack is the same one from voltaic systems, just tricked out. For a detailed parts list, check the pop sci link above. Q:What do you call someone who hacks solar powered gadgets? If you come across a blog about the Safari rally in Kenya, give me a heads up would you? (condolences - rough translation) The swahili word carries with it much more feeling than i could translate. Intra trade increased by about 20% this past year. Considering Africa's population, isn't that not an immense market and potential? More of that please. May i reiterate M's point from Pragma 6 on real solutions especially on civic education. an argument can be made that the seedlings of an African Renaissance have already sprouted and need some serious watering and tending. I would like to point to KJ's Head on corrishon. If you follow the series carefully, you will see empowering messages about voting, democracy and the voice of the youth, especially encouraging them to get voting cards for 2007 elections in Kenya. Mshairi highlighted a quote from Muammar Gaddafi who was speaking at the African Union summit. 'Begging will not make the future of Africa - it creates a greater gap between the great ones and the small ones,' and Black Ambition gave me a heads up on gaddafi's call for a borderless Africa. The African Union IMO holds much promise in conflict resolution amongst other things. The AU is currently in Darfur but with alimited mandate. [According to an African Union (AU) press release, on May 28, 2004, the AU committed a ceasefire monitoring mission to the Darfur region. Currently, the mandate of the African Union (AU) troops is to oversee the ceasefire and protect the monitoring force on the ground. Their mandate does not extend to the protection of civilians whose lives are in constant danger; AU troops can only protect civilians from imminent threats during accidental "encounters."] I think it comes down to lack of cash. If African leaders were more forward looking and took ownership of our problems, then funding for the AU would not be dependent on appeals for 'logistical support' to the west/GS to intervene in troubled areas, and if we did intervene it would be more than to deal with accidental encounters. In the budgets of African countries, an allocation for payment into the AU would be good. Diaspora contribution to the AU would also be a good thing. Feel free to share what you think, especially in regards to the AU. Cartoon Network is running a marathon of Foster's home for imaginary friends on Cartoon Network this sunday afternoon. Its one of the best cartoons IMO. If there are dvd's available please send me a link.